This map comes to us via the good offices of the esteemed Eric Fisher. 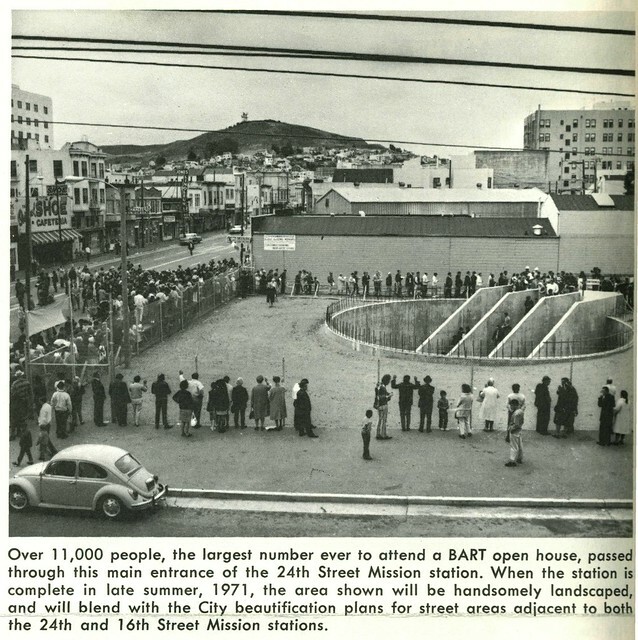 It shows what a group of city planners saw in 1968, when they evaluated Bernal Heights as an urban canvas in need of some serious beautification. So with that as the context, it’s fascinating to see what those planners saw when they looked at Bernal Heights as set of assets and opportunities — at a time when Bernal’s streets were a little rougher around the edges and Bernal Hill was still just a feral, open space. The “Design Elements” map notes the features that make Bernal feel like Bernal; the “physical elements that give definition and identity to Bernal Heights.” It identifies existing resources. It respects the topography. It celebrates great views. It highlights open spaces. It seeks to nurture interesting clusters and sub-corridors. If all this sounds kind of familiar and ho-hum, it’s because that’s pretty much what we’ve spent the last 45 years doing here in Bernal Heights. So hats off to those clever planners in 1968. From the vantage point of 2013, we can now say that their vision looks pretty great today. UPDATE April 2016: Neighbor Andras tells us that the full text of the 1968 Bernal Heights Improvement Program report is available here. +1. Selfishly, because I live on Precita, and look out on a thicket of overhead wires. Likewise. I really don’t understand why the under grounding plan was so un-comprehensive, but I have been told many times that more under grounding is one of those things that just isn’t going to happen. Maybe our dynamic supervisor will take the lead and make it happen! I happen to live on a street with buried utilities, and it is much nicer. The cost of burying lines is exorbitant, though, and even worse in established neighborhoods. Who will pay for it? My in-laws in the LA area recently went through the process, and it drove a wedge between neighbors who wanted to get rid of the poles and wires and had the money to pay for it and the neighbors (many on fixed incomes) who would struggle to pay the levied fee. The utilities were finally under-grounded on Powhattan and the surrounding blocks about four years back. It’s a ginormous job and each house that is connected is a unique situation that must be dealt with usually to the tune of $1K, especially if you don’t want the pipes crawling up the front of your house. At the same time, they also ‘beautified’ the street for a few blocks. The new stairways from all the north-south streets leading to the south side of the hill were also done in the last five years. Powhattan from Gates to Nevada was paved about 8-9 years back. It is interesting that most of those things were on the ‘master-plan’ and only took 40-50 years. The beautiful view of San Bruno Mountain from the Comfy Couch* definitely is improved without wires. I never liked the idea of paving the remaining dirt streets in Bernal. When Franconia was finally paved it was because “it would make it easier for firetrucks to get access”, an odd comment given that Franconia existed just fine as a dirt road for 100 years with no fire problems. I say that newcomers owe it to their new community to respect the will of those who were already there and not screw things up. South of Market is a perfect example of newcomers who moved into the junk condos (aka “live/work lofts”) and then began to complain about noise from the bars and the machine shops, forcing many of them to closer or spend tens of thousands of dollars on soundproofing — even though those businesses had been there for decades. I’m not sure what they’ve done to Ogden st or in what shape it was before that plan, but it’s currently quite messy. I kind of like the idea of turning most of it into mini-parks. I guess few people realize that lots of antennas have already been removed from the tower at the top of the hill. AT&T used to have inter-city TV relays with big “horn” antennas. Those all disappeared a couple years ago, so now the site doesn’t look very busy at all. Tommy, Bernal is the big hill in the background of that photo taken at 24th & Mission. How about making the top of the Hill into a more friendly place where people can come together to watch stars, eat lunch etc. Wind chimes, art work, tables, etc. Take don the fence open iup the top of bernal to the people!!!!!! When I moved here (’78) I used to tell people I didn’t mind the microwave towers, as it was quite a convenience if one needed to thaw a chicken.